Most knitting garment patterns have some sort of small/medium/large sizing. In addition to that method of knit sizing, most patterns also give you the garment’s finished chest circumference. Chest size: Some patterns also helpfully tell you that a medium fits a 38- to 40-inch chest. If this is the case, you don’t have to do much work because if you know your chest measurement, you know exactly what size to make for the garment to fit as the designer intended. Schematic: If you can’t find sizing information up front in the pattern, go to the schematic. 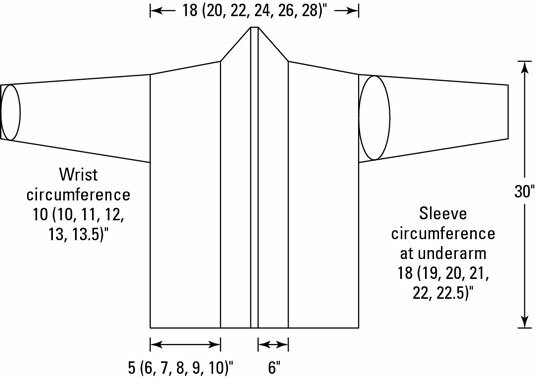 Schematics are illustrations that give you detailed information on the measurements of the garment for each size (like the one in this figure). The numbers given for each measurement in a schematic correspond to the sizes covered by the pattern, with the smallest size first and the largest size last, just as they are in the pattern directions. Unless it’s indicated otherwise, schematics give flat measurements, so you need to multiply the width of the front by two to get the garment’s chest circumference. Finished chest circumference, plus ease: If you have only the finished chest circumference of a garment, you must take ease into account. Ease is the amount of room between you and your clothes. In other words, unless the garment is meant to be very close-fitting, you don’t want to knit it exactly to your bust size.